My grandfather, Michael John Hanley Jr. (1924-2015), and grandmother, Betty Grace Sears Hanley (1924-1981), took a trip to Ireland in 1971. This is one of the photos from that trip. These horse drawn caravans appeared to be popular tourist attractions in and around the County Cork areas that my grandparents visited. This one was from an outfit called "Blarney Romany Caravans". Blarney is a city in County Cork, a bit northeast of the Bears Peninsula where my 2nd great grandmother, Ellen Sullivan Hanley (1850-1938), and her family came from. Specifically they lived in the Ballydonegan area. Blarney is also home of the famous Blarney Castle where the mythic Blarney Stone is located. The legend goes that if you kiss the Blarney Stone you will be bestowed with great eloquence and skillful flattery. I'll have to fact check this with my family, but I seem to remember grandpa telling a story about losing his glasses in his ritualistic kissing of the Blarney Stone. 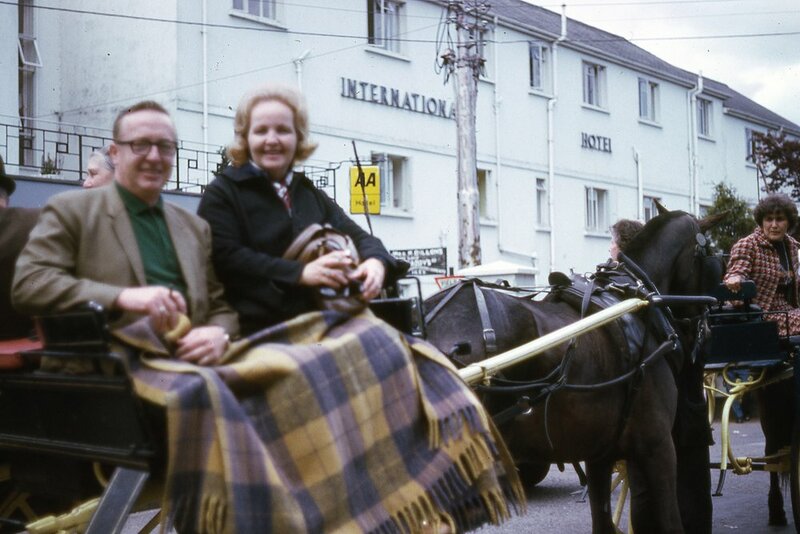 Here is a photo of my grandparents from that same trip, though I don't think this is in the Blarney area. My best guess is that it is the International Hotel in Killarney, Ireland, another location I know they visited. Back to Blarney though! I did a youtube search and found a couple of lovely vintage videos of people touring this area in the late 1960s and early 1970s, right around the time of my grandparents visit. These both give a good feel of what my grandparent's visit might have been like. Enjoy! 1968, a holiday with Blarney Romany Caravans. Did my grandparents, in fact, kiss the Blarney Stone? Where is that 2nd photo taken? Killarney? What was the International Hotel and is it still there? Do you have roots in County Cork, Ireland? What sort of stories or lore have you heard about your family's origins there? Was this "true" Ireland or just the touristy part? What is the area like today? What do you think, wonder, and feel as you look at these photos and videos? What kind of mood do they convey?